GI issues are common in those with autism. It is believe that nearly 90% of all autistic children suffer from Inflammatory Bowel Disease, Celiac Disease, Colitis, constipation, diarrhea, bloating etc. Scientists are finding that the intestines are a very important piece of the puzzle. The intestines are responsible for digesting food, absorbing nutrients and expelling waste. Everything put into your mouth will be absorbed or expelled depending upon the health of your digestive tract, which must contain a good balance of naturally occurring healthy bacteria known as gut flora. It is believed that the GI tract is responsible for at least 70% of the immune system and is responsible for producing 80% of the brain’s neurotransmitters. The intestines are now being referred to as the body’s 2nd brain. The functioning of the digestive tract can be damaged by refined sugars and grains, coffee, alcohol, birth control pills, antibiotics, and heavy metals like mercury and lead. A poorly functioning digestive tract with a lack of diverse gut flora contributes to a large number of diseases and health issues. Below is a chart to tell you how your digestive system is working. 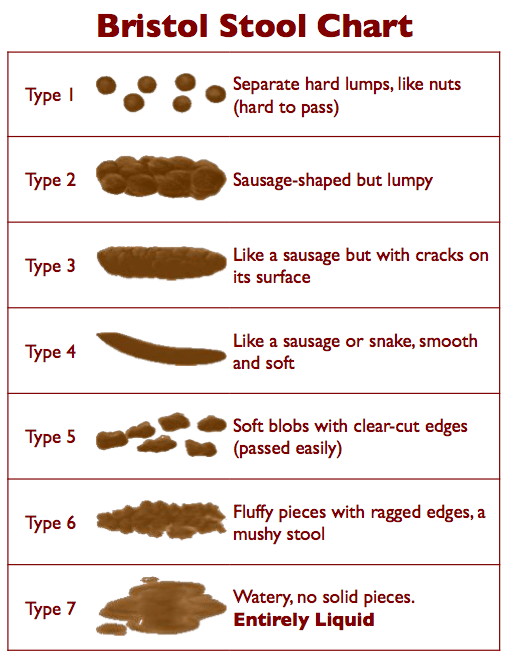 Stool types 1 – 3 are considered to be various levels of constipation, while types 5-7 are considered various levels of Diarrhea. Types 4 and 5 are the most ideal. Food allergies and sensitivities are also common among autistic children. True allergies, also known as Type I or IgE allergies, only affect a small percentage of the population. These result in immediate reaction after exposure, which includes swelling, itching, rash, wheezing etc. A rising number of people are experiencing delayed reactions to various foods, which is a result of IgG and IgM antibodies in the blood and tissue. These antibodies are created by the immune system when undigested foods are allowed to enter the blood and lymph system of a weakened intestinal lining, known as “leaky gut.” As mentioned previously, the digestive tract can be damaged by a diet high in refined sugars and grains, coffee, alcohol, birth control pills, antibiotics, and heavy metals like mercury and lead. This results in food sensitivities, which can manifest in different ways. Symptoms of food sensitivities include darkness under the eyes, diarrhea/constipation, brain fog, headaches, fatigue, eczema, joint pain, sleep disorders, hyperactivity, anxiety, and chronic runny nose/congestion/post nasal drip. In addition, it is common to crave foods that you are allergic to, due to the histamine response that your body produces in reaction to the allergen. While histamines are bad for the body, they also produce a calming effect. It is not uncommon to see autistic children restrict their diets to certain things, only to find out that they have an allergy to that item. While the diets can give you good guidelines, one must still pay attention to stools, food sensitivities, and behaviors. While one diet may be tolerable for one person, it may not be tolerable for another. Some children have trouble digesting fats, proteins, oxalates and/or phenols. Please operate within your child’s personal parameters. Unfortunately, the soil that our food is grown in is lacking in nutrients. Our food supply is inadequate at providing what our bodies need. With that being said, it is wise to supplement with the most bioavailable forms of vitamins and minerals, in addition to the healthy diet. Raw or low temperature dairy from pasture fed cows. Raw or low temperature dairy from pasture fed goats. **I did not list soy milk as this generally comes from genetically modified sources and has been found to be an endocrine disruptor. Urban Poser – has egg free, nut free cookie recipes that are delicious. The seasonings are crucial. L-Glutamine – Glutamine is an essential amino acid that is anti-inflammatory and necessary for the growth and repair of your intestinal lining. L-glutamine acts a protector and coats your cell walls, acting as a repellent to irritants. Sodium Butyrate – Butyrate is one of the main nutrients used by cells that line the colon. Quercetin – Can be found in Neuroprotek, which is commonly used in the autism community.